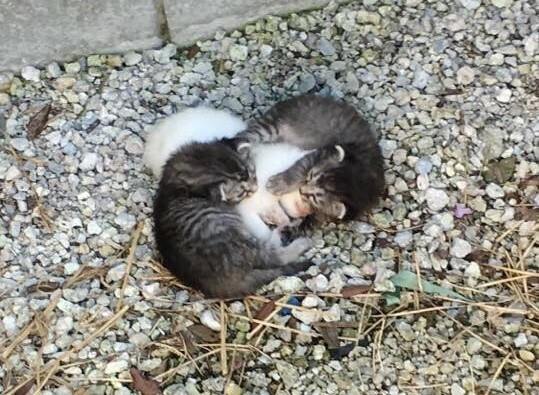 A litter of three tiny kittens were found huddled together on a street in Naples. 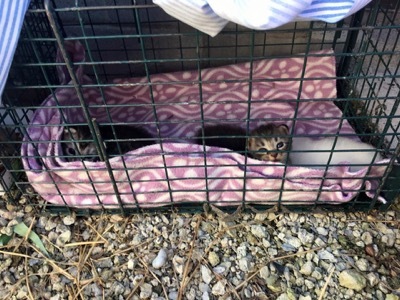 It was a really hot summers day in Naples when Megan Sorbara from Naples Cat Alliance received a message that three kittens had been abandoned by their mother. She rushed to the scene and realised immediately that something wasn’t right. The two tabbies were wrapped around their trembling sister as if trying to protect her. 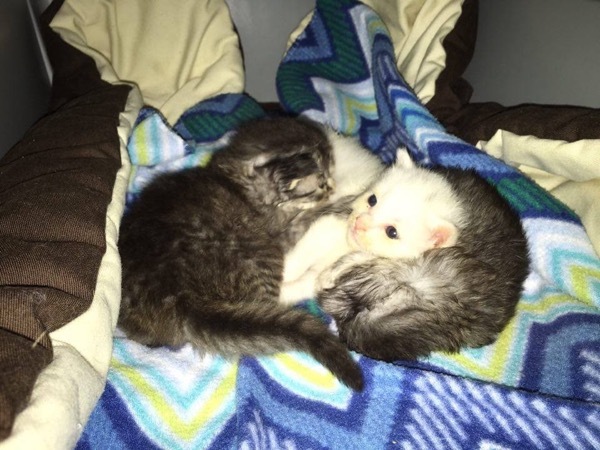 It soon became apparent that the tiny white kitten wasn’t able to walk and her siblings were doing everything they could to comfort her. Once back at Naples Cat Alliance they discovered that she had a very pronounced head tilt to the left but her appetite was good and she rolled around to get where she wanted to go. Megan is bottle feeding the kittens round the clock and the two tabbies continue to wrap themselves around their sister, but now they are purring. 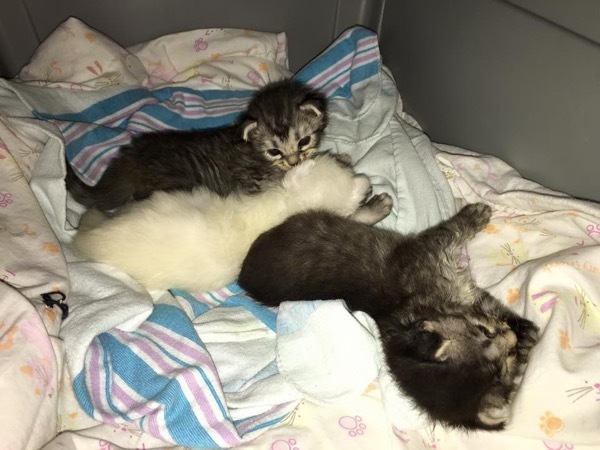 The three kittens, now named Praline, Pistachio and Coconut may soon be reunited with their mama, she has been spotted near where they were found but volunteers are having trouble capturing her. 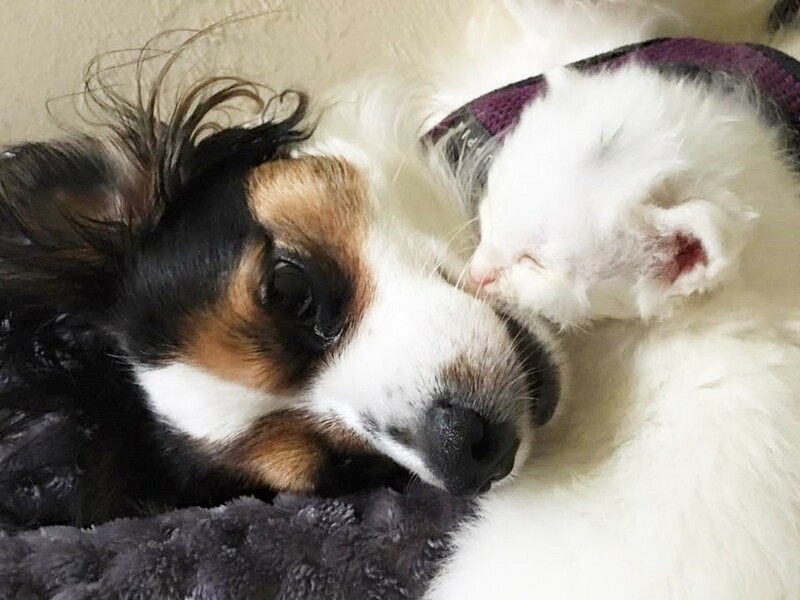 Meanwhile, Megan’s dog Bitsy, who was rescued herself two years back, has taken on the role of foster mother and is never far from their side. 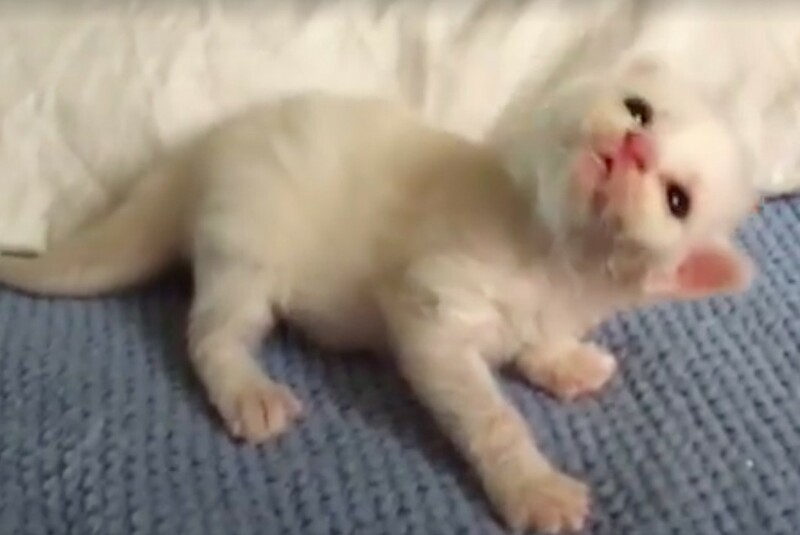 With the help of Bitsy and her siblings, Coconut is getting stronger every day, she even manages to give her canine carer a few kisses and cuddles and in return Bitsy encourages her to climb and move around. The team are continuing their mission to find the mama so they can reunite her with her children where she will be looked and have a chance to find a forever loving home. Even now, Praline and Pistachio wrap themselves around her and along with Bitsy, she gets all the love she needs to help her make a full recovery. Lets hope that their mother will soon be by their side. Click here to see the hula hoop cat!